Before They Were Heroes: Sus Ito’s World War II Images is the inaugural exhibition in Sharing Our Stories, a new series of exhibitions drawn from JANM’s extensive permanent collection. A celebration of the donation by Susumu “Sus” Ito of his vast archive of photographs and negatives taken while on duty during World War II, Before They Were Heroes gives the public a rare and breathtaking look at the daily lives of the 522nd Field Artillery Battalion of the celebrated all-Japanese American 442nd Regimental Combat Team. Born in California in 1919 to a family of immigrant tenant farmers, Sus Ito was drafted into the U.S. Army in 1940. Following the bombing of Pearl Harbor, he was switched to civilian duty while his family was sent to live at Rohwer concentration camp in Arkansas. 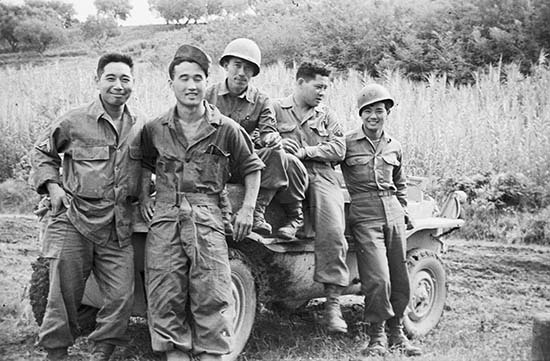 In the spring of 1943, Ito was selected to join the 442nd’s 522nd Field Artillery Battalion. He went on to serve in all of the 442nd’s campaigns in Italy, France, and Germany, eventually rising to the rank of lieutenant. Ito’s tour of duty included such high-profile historic events as the rescue of the Lost Battalion and the liberation of a subcamp of Dachau. During his time in Europe, Ito kept three things with him: a small bible, a senninbari (Japanese thousand-stitch cloth belt traditionally given to soldiers who are going to war, made for Ito by his mother and the other women at Rohwer), and a 35mm Agfa camera. With the camera, he took thousands of photographs documenting his life on the road; the young soldiers are seen posing next to their jeeps, walking in the snow, swimming in a river, playing chess, and even visiting tourist destinations while on leave. Unseen for decades, these images are remarkable for their detail and their humble, day-to-day quality, providing a fascinating contrast to the heroic images typically found in history books. Ito went to great lengths to preserve the negatives, even having some of them developed at villages along the way. To provide context for the photographs, the exhibition includes historical background, an exploration of Sus Ito’s life before and after the war, and material artifacts from the era such as Ito’s senninbari and uniform. The exhibition also examines issues of preservation and conservation related to the negatives and photographs themselves. Before They Were Heroes was on display at the Japanese American National Museum July 14–September 6, 2015. Below are sponsors of JANM’s presentation of the exhibition. Lily Anne Y. Welty Tamai, JANM’s Curator of History, presents a behind-the-scenes look at the exhibition.